Aggregate” is a collective term for the mineral materials such as sand, gravel and crushed stone that are used with a binding medium (such as water, bitumen, portland cement, lime, etc.) to form compound materials (such as asphalt concrete and portland cement concrete). By volume, aggregate generally accounts for 92 to 96 percent of HMA and about 70 to 80 percent of portland cement concrete. Aggregate is also used for base and subbase courses for both flexible and rigid pavements. Aggregates can either be natural or manufactured. Natural aggregates are generally extracted from larger rock formations through an open excavation (quarry). Extracted rock is typically reduced to usable sizes by mechanical crushing. Manufactured aggregate is often the byproduct of other manufacturing industries. These rocks are primarily crystalline and are formed by the cooling of molten rock material beneath the earth’s crust (magma). These rocks are formed from deposited insoluble material (e.g., the remains of existing rock deposited on the bottom of an ocean or lake). This material is transformed to rock by heat and pressure. Sedimentary rocks are layered in appearance and are further classified based on their predominant mineral as calcareous (limestone, chalk, etc. ), siliceous (chert, sandstone, etc.) or argillaceous (shale, etc.). These are igneous or sedimentary rocks that have been subjected to heat and/or pressure great enough to change their mineral structure so as to be different from the original rock. Manufactured rock typically consists of industrial byproducts such as slag (byproduct of the metallurgical processing – typically produced from processing steel, tin and copper) or specialty rock that is produced to have a particular physical characteristic not found in natural rock (such as the low density of lightweight aggregate). Aggregates are produced in a quarry or mine (Figure 1) whose basic function is to convert in situ rock into aggregate with specified characteristics. Usually the rock is blasted or dug from the quarry walls then reduced in size using a series of screens and crushers. Some quarries are also capable of washing the finished aggregate. An aggregate’s mineral composition largely determines its physical characteristics and how it behaves as a pavement material. 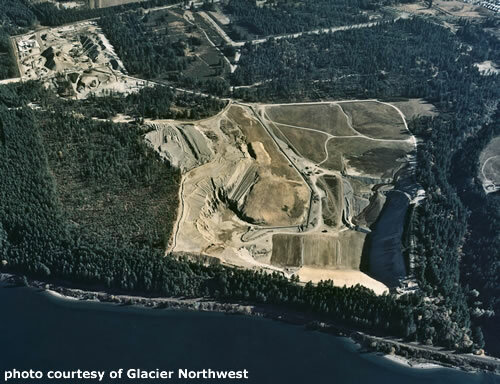 Therefore, when selecting an aggregate source, knowledge of the quarry rock’s mineral properties can provide an excellent clue as to the suitability of the resulting aggregate. Cordon (1979) provides some general guidelines for aggregate used in HMA. Aggregates that are hydrophilic (water-loving) tend to strip more readily since water more easily replaces the asphalt film over each particle. Freshly crushed aggregates with many broken ionic bonds tend to strip more easily. In general, relationships between mineral and physical properties are quite complex, making it difficult to accurately predict how a particular aggregate source will behave based on mineral properties alone. While relatively unimportant for loose aggregate, aggregate chemical properties are important in a pavement material. In HMA, aggregate surface chemistry can determine how well an asphalt cement binder will adhere to an aggregate surface. Poor adherence, commonly referred to as stripping, can cause premature structural failure. In PCC, aggregates containing reactive forms of silica can react expansively with the alkalis contained in the cement paste. This expansion can cause cracking, surface popouts and spalling. Note that some aggregate chemical properties can change over time, especially after the aggregate is crushed. A newly crushed aggregate may display a different affinity for water than the same aggregate that has been crushed and left in a stockpile for a year. Aggregate is often used by itself as an unbound base or subbase course. When used as such, aggregate is typically characterized by the preceding physical properties as well as overall layer stiffness. Layer stiffness is characterized by the same tests used to characterize subgrade stiffness.